Yoga for Mind, Body and Spirit provides you with an excellent summary of the historical development of yoga and its practices. This book goes into detailed descriptions of certain yoga practices for physical, mental and spiritual development; for different-aged people; for different situations and for people with certain health concerns. It describes practices which are helpful for those concerned about mental health, anxieties or fears; people who require emotional release and those who require interpersonal-kinds of buffers between them and other people. This book also describes practices which have definitive effects based in tradition, together with the author's experiences of the practice and teaching of yoga over many years. The author describes some short, medium and long programmes for individuals of different inclinations and personalities, and having different amounts of time available to them. This hopefully will allow you to take something from this book and to utilize it in your life in a meaningful way to help not only with your own personal evolution but also with your mutually encompassing social evolution. Author, Dr. John R.M. Goyeche, currently practices in Hawaii and has 25 years of clinical experience in hospitals, mental health centres and rehabilitation clinics. He has been called as an expert witness at courts in British Columbia, Ontario, Saskatchewan and New Brunswick. He has acted as an Employee Assistance Consultant to several companies and has also taught psychology for four years at university-level. Dr. Goyeche is a Fellow of the International College of Psychosomatic Medicine, a member of the Canadian Society of Clinical Hypnosis and a member of the International Institute for Bio-Energetic Analysis. He is author of two other books published by Productive Publications: Benefit from Hypnosis, Hypnosis by Telephone and Self-Hypnosis and Winning Over Depression. Dr. Goyeche studied and taught yoga on three continents and in many settings for 30 years. 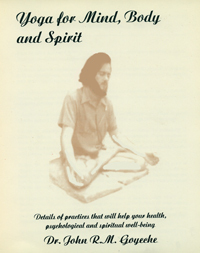 Yoga for Mind, Body and Spirit: Details of Practices That Will Help Your Health, Psychological and Spiritual Well-Being by Dr. John R.M. Goyeche: 188 pages; softcover; ISBN 978-1-55270-056-3; published in 2001; Canadian $24.95.